The Hunter 37 is effectively a smaller sistership to the Hunter 40, which was introduced in something of a rush in 2012 as Marlow Hunter—formerly Hunter Marine—celebrated its 40th birthday and a change of ownership.  The Hunter 37 is effectively a smaller sistership to the Hunter 40, which was introduced in something of a rush in 2012 as Marlow Hunter—formerly Hunter Marine—celebrated its 40th birthday and a change of ownership. 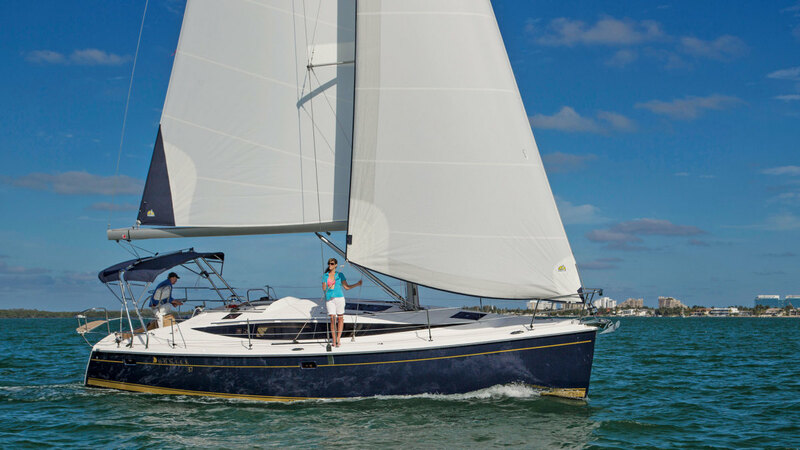 Like the 40, the 37 features an aggressive modern appearance, with a dramatic port window accent, a fine concave bow, a hard-chined hull and lots of beam aft. 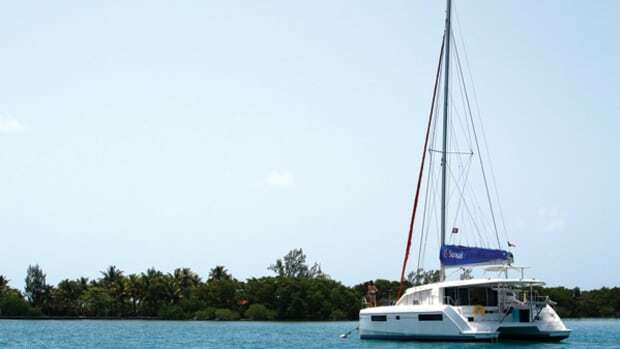 It also packs a lot of accommodation space into a hull of modest overall length and is an easy boat for a small crew to sail efficiently. The boat’s hull is all solid laminate below the waterline, while the topsides are cored with end-grain balsa. The exterior layers of the laminate are 3-ounce fiberglass cloth set in vinylester resin finished with an NPG gelcoat to resist osmotic blistering. Interior layers are set in a blended polyester/epoxy resin. Kevlar is added to the laminate in likely impact areas forward. The deck is also balsa-cored, with aluminum backing plates set in a solid laminate under the hardware, which is through-bolted in place. The standard ballast keel is iron, but lead ballast can be specified as an option. 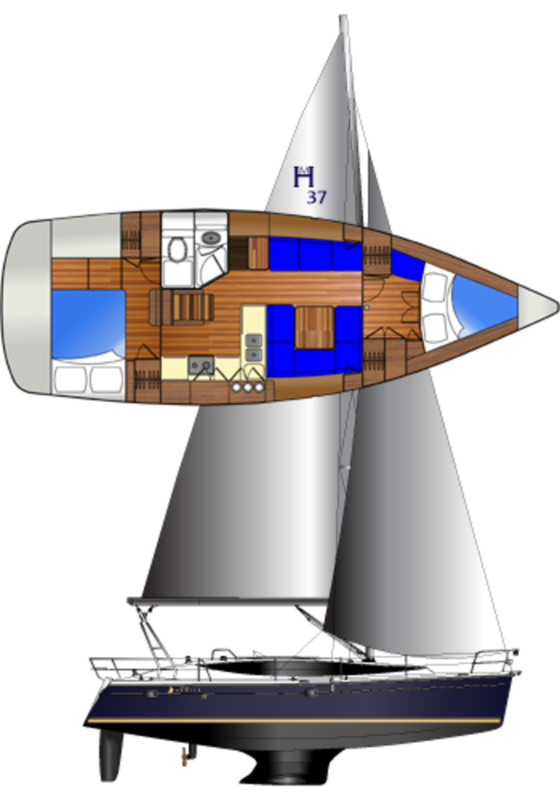 As with the Hunter 40, the 37 looks ungainly in drawings, but when viewed afloat is attractive and striking. I had thought the long elliptical window accent wouldn’t look quite right on a shorter hull and cabinhouse, but in fact, it works well. Unlike the 40, the new 37 does not have twin wheels in the cockpit. 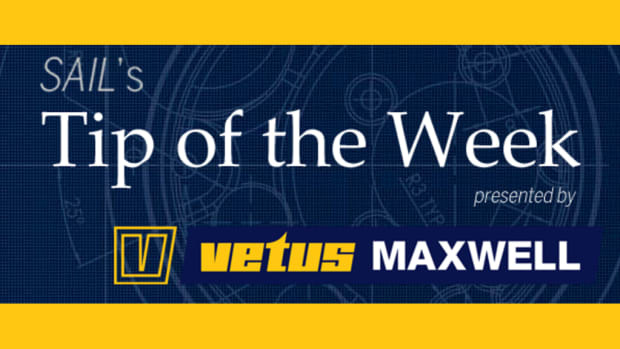 However, our test boat came equipped with a nifty folding Lewmar wheel, mounted on a Lewmar pedestal that neatly integrated the Yanmar engine controls and a suite of Raymarine electronics. At rest, with the wheel folded, it was easy to move around the helm when boarding the boat from the large fold-down transom platform. When folded up, the top of the platform also serves as the helm seat, and is nicely scalloped and finished with attractive teak trim. As is routine now in Hunter cockpits, the coamings are high and comfortable, and the mainsheet controls run off an overhead main traveler arch. This not only keeps the sheet out of the cockpit, but ensures the controls remain within easy reach from the helm. Also accessible from the helm are the jib sheets, which on our test boat were led to a pair of electric Lewmar Revo linked reversible winches. Theoretically these make it possible to tack the overlapping jib without touching the sheets, as one winch automatically feeds out line as the other reels it in, although during our test the winches were unlinked and we had to tack manually. The boat’s sidedecks were clean and untrammeled, with collapsible fold-down cleats to save bare toes from stubbing and make it that much easier to move forward. There are also good handrails on the coachroof for security. Aft there is a huge, easily accessed cockpit locker to port. However, the anchor well forward was somewhat problematic in terms of accessibility on our boat, as the hatch was fouled by the jib’s furling line lead. Also, the anchor chain ends up stowed under the V-berth in the forward stateroom, which is good for weight distribution, but makes the chain hard to reach when something gets snagged. One other quarrel I had with the deck layout is that there is nowhere in the cockpit to mount secondary winches, which is something you might like if you spring for the optional removable bowsprit and want to more easily fly a gennaker or a big A-sail. 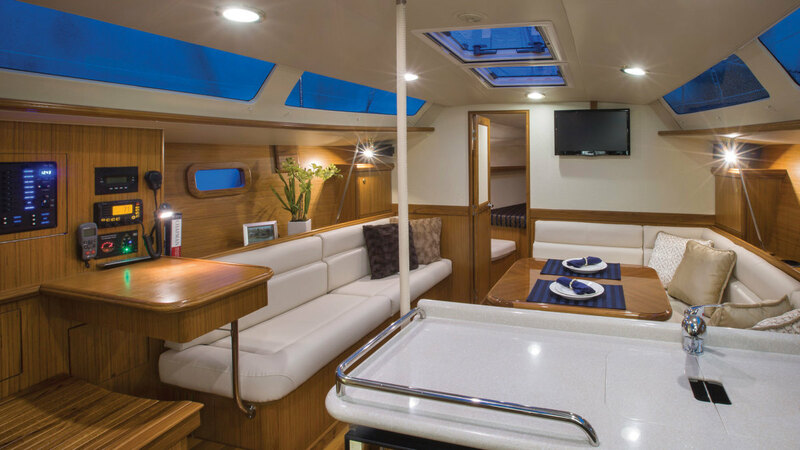 The Hunter 37 is available with just one interior layout, which puts large staterooms at either end of the boat, and the saloon, galley and one head in the middle. The aft stateroom, under the cockpit, is denominated as the “owner’s stateroom,” but I’m not sure it’s the one I’d choose if this were my boat. It has a very large athwartships double berth, but vertical clearance is necessarily limited over the middle of the berth, so that the only place you can stand up straight is right by the door. It also has immediate access to the head, although on a single-head boat this isn’t necessarily a good thing when you have guests aboard. The forward stateroom by comparison has more privacy, 6ft 6in of headroom, better storage spaces and better light and ventilation. 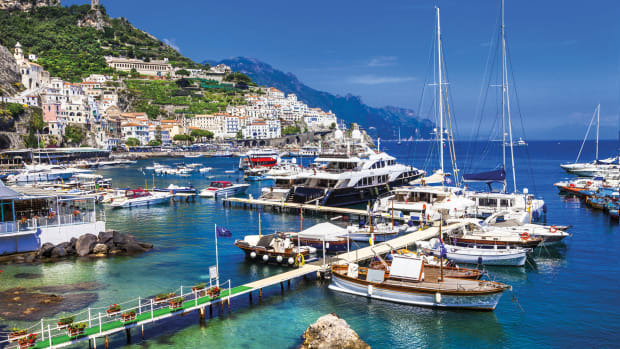 True, the double V-berth is smaller than the one aft, but it has adequate space at the foot and will not be a trial if you enjoy the company of those you share it with. The galley, to starboard, has scads of counter space, finished in Corian. 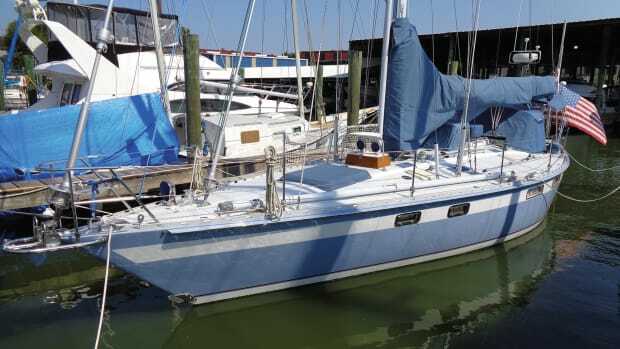 There’s also lots of space for fridges and a microwave, although the twin sinks are a bit shallow and well offset to starboard, which may be a problem when the boat is heeling hard on port tack. The head is brilliant, a model of efficiency, with a toilet, vanity and segregated shower stall all packed neatly into one relatively compact space. 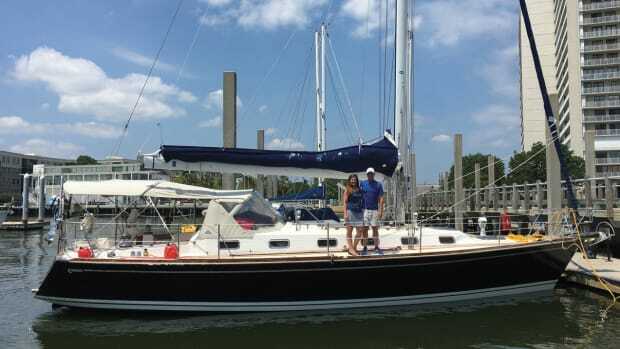 I sailed the boat on Chesapeake Bay, off Annapolis, in annoyingly light wind. 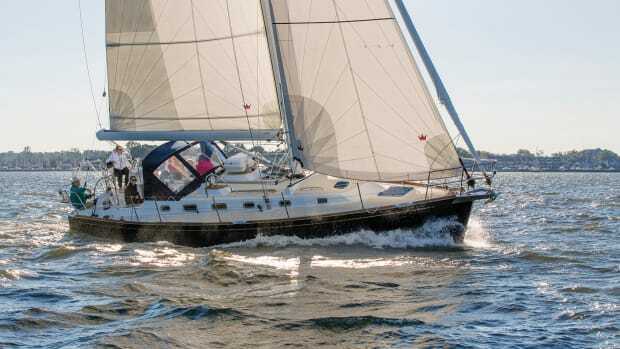 As with all Hunters, the 37 boasts a B&R rig with no backstay and spars by Seldén. I have said this before and I’ll say it again: with a rig like this it makes no sense to order the optional in-mast furling mainsail. 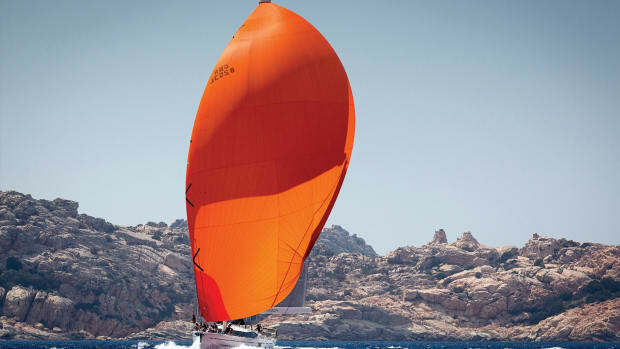 Only with a standard full-roach, full-batten mainsail can you take full advantage of the lack of a backstay and sail the boat to its maximum potential. Alas, no one listens to me, so our test boat was equipped with a furling main, as that’s what most people order. Nor did we have a gennaker or spinnaker aboard. In spite of being so hobbled, we did surprisingly well. In just 3-5 knots of true wind, we made 3 knots of boatspeed closehauled at a 40-degree apparent wind angle. Cracking off a bit, we made 3.4 knots at 45 degrees, 3.5 at 90, and 2.7 at 130. To give an idea of what’s possible, in one mad gust that spiked to 10 knots, we got the boat flying at 6 knots, no problem. The boat had a good light-air helm. Steering was neutral and true, with no lee helm at all. Our test boat was over-endowed with the optional 40hp Yanmar engine (as opposed to the standard 29hp engine) and the optional fixed three-blade prop (as opposed to the standard two-blade wheel). Consequently, we tore through the flat wind-free water at 8.8 knots with the throttle all the way down at 2,950 rpm. At 2,400 rpm we made 8 knots. Even at a sedate 2,200 rpm, we were still bustling along at 7.7. Backing up, the prop bit instantly and helm control was very good. Turning hard going forward we could spin the hull within little more than a boatlength.